This summer’s comiccon season kicks off Memorial Day weekend with Phoenix Comic Con. There are an abundance of things to see and do at PHXCC. Here are some of the activities you can look forward to! This year’s guest list features a slew of actors from popular television and movies, including: Karen Gillan (Doctor Who, Guardians of the Galaxy), Danny Trejo (Machete), John De Lancie (Star Trek: TNG), John Berenthal and Elden Henson (Daredevil), Alan Tudyk (Firefly, Star Wars: Rogue One), Bonnie Wright (Harry Potter), and many, many more! Voice actors also take the spotlight at PHXCC this year. For fans of Dragonball Z, Christopher R. Sabat (Vegeta/Piccolo) and Sean Schemmel (Goku) will be in attendance. Other voice actor guests include celebrated anime voice actor Vic Mignogna (Edward Elric in Full Metal Alchemist) and the one and only, Kevin Conroy, the voice of Batman for over 20 years! Phoenix Comicon also features popular sci-fi and fantasy authors such as Diana Gabadon (Outlander), Claudia Gray (Evernight), Brent Weeks (The Way of Shadows), Jim Butcher (The Dresden Files), Terry Brooks (the Shannara series), and Alan Dean Foster (just about anything and everything sci-fi). Half the fun of going to comicon is the myriad of panels that cover every topic and fandom imaginable. Main guest panels are hosted on the third floor of the west building in rooms 301A and 301B, right across the bridge from the Hall of Heroes, where all the guest photo ops take place, so you can sit down and relax and watch your favorite stars talk about their projects. Acclaimed fantasy/sci-fi author, Michael A. Stackpole is hosting a weekend long writing workshop that covers every topic from conception to selling your completed novel. Novelist Timothy Zahn is also hosting a couple writing workshops as well. Each individual writing workshop panel is $8 to attend. Cosplayers will be out in full force at Phoenix Comicon, braving the heat to show off their most elaborate creations. Make sure to clear out your SD card and make room for all the pictures of cool cosplayers you’re going to be taking this weekend! 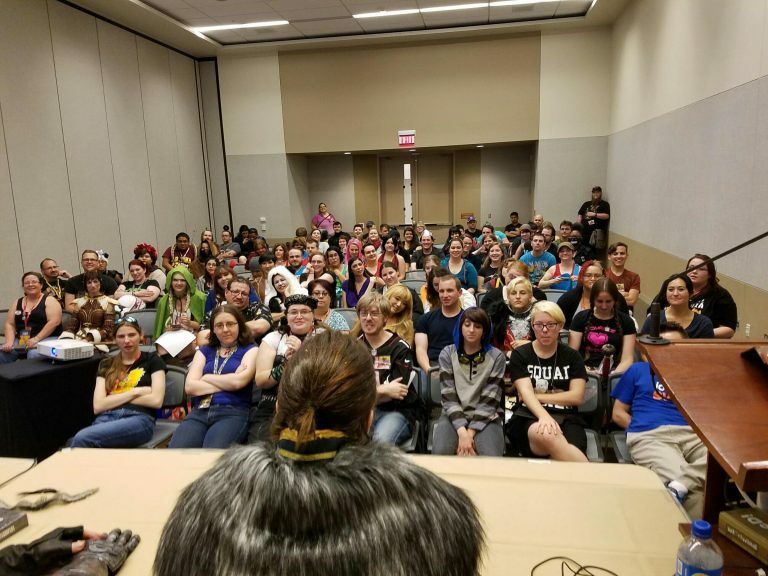 If you are new to cosplay and want to learn how to make amazing costumes of your own, there are plenty of tips and tricks panels hosted by experienced cosplayers and professional prop makers to help you craft your own costumes. There is even a Cosplay Lounge and Repair Station located in North 227BC to help you fix your costumes on the fly! STAY HYDRATED. This cannot be stressed enough! Make sure you drink plenty of fluids, especially those with electrolytes to help combat dehydration. STAY INDOORS. While PHXCC features a few fun outdoor activities such as Con on Adams St., bands, outdoor performances, and the car show, it’s always best to spend as little time outside in the heat as possible. Fortunately the Phoenix Convention Center is always well air-conditioned and the sky bridge and exhibitor hall floor span the north and west buildings so there is no need to set foot outside at all! EAT SOMETHING. No, seriously. Eat something. With the adrenaline rush from all the fun at comicon it is very easy to forget to eat a full meal. It’s always a good idea to bring some snacks (protein bars are great) along with you in case you don’t want to stop and sit down for a full meal. While the convention center does have a full food court, it get’s insanely crowded during the convention. Better to spend your money at one of the local restaurants downtown. If you’re looking to save some cash, the Cityscape on 1st St. and Washington has a Five Guys, Jimmy Johns, Chipotle, Starbucks, and many other affordable restaurants and is only a short walk or a quick light rail ride away. BOOKMANS WANTS YOU TO STAY HYDRATED AND HAVE FUN!